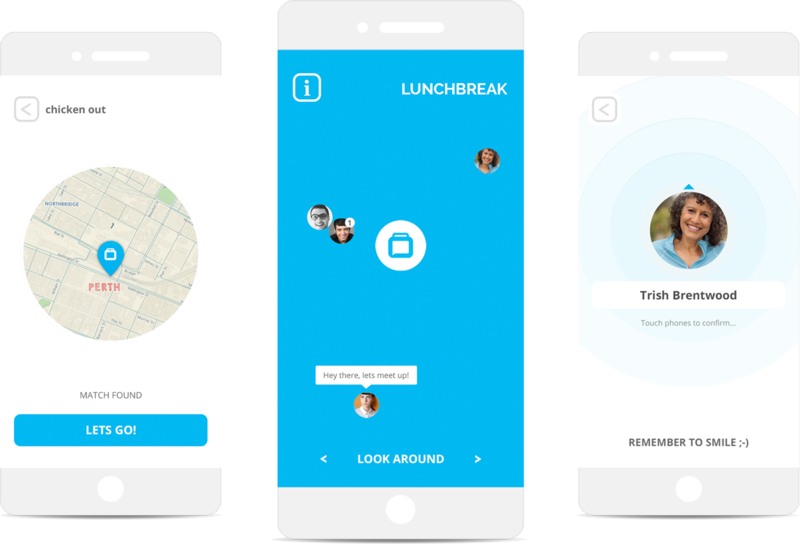 Lunch Break is a mobile app designed for professional networking. Business is heading more and more towards the sole trader and as a result, people need to network. Lunchbreak allows busy people to get 30 minutes of networking done while eating lunch. To date (July 2015) there are 1.5 million available apps on the Apple store. Lunch Break was not going to be another stale, restrained app. My focus was on personification, creating an app with personality. Icons use the same corner radius as the logo, this is also applied to imagery. Icons are rounded 2px and over simplified. Navigation / setting (primary or active icons) are always contained in a rounded rectangle and executed in the brand colour. Swipe navigation was not prolific in 2015 but was a core feature of my app. However as the app would include users from the older generation a safety, persistant button nav was included at the top. This app was to function as an extension of linkedIn and to that end you would need to log in with your linkedIn account. This would not only unify the information input and simplify the backend but also establish precedent in the user’s mind about the function / discourse of the app. Lunch Break would be a way to network during prime time, in city CBDs. Contrary to popular belief, professional working individuals are not robots. Most networking is done informally at bars, clubs and restaurants. For this reason I chose to use a very informal sometimes jovial tone of voice. Two other reasons were; 1 most apps lack any sort of personality and 2 meeting new people can be daunting and being casual can help soften the blow. Priority (paid) locations would be supplied as meeting points for the users. Users would also be presented upon arrival with the specials / menu options through foursquare (location-based advertising). This would provide enough revenue to maintain the app. Even though linkedIn changing their api made this app impossible I still really enjoyed putting it together. Researching business models for startups, theory crafting user experience and experimenting with unique navigation methods makes self-initiated projects like this a valued endeavour. Hopefully, in the future, LinkedIn change their API back as I think this could be a very useful application.